The match Bayern Munich-Bayer Leverkusen 1. Bundesliga will start today 13:30. Referee in the match will be Tobias Welz. Team Bayern Munich is at the top place in the table (2 place). In 5 last games (league + cup) Bayern Munich get 6 points. Leading players Bayern Munich in 1. Bundesliga is: Thomas Mueller 2 goals, Robert Lewandowski 2 goals, Leon Goretzka 1 goals. Most assists in the club have: Thomas Mueller 2 assists, Robert Lewandowski 1 assists, Leon Goretzka 1 assists. In Bayern Munich not occur in the match due to injury: Kingsley Coman. Team Bayer Leverkusen is in the releagtion zone of the table. 16 position. In 5 last games (league + cup) Bayer Leverkusen get 0 points. The best players Bayer Leverkusen in 1. Bundesliga, who scored the most goals for the club: Leon Bailey 1 goals. Players with the most assists: , Mitchell Weiser 1 assists. Injured players Bayer Leverkusen: Panagiotis Retsos, Julian Baumgartlinger, Joel Pohjanpalo. Direct matches: Bayern Munich won more direct matches. 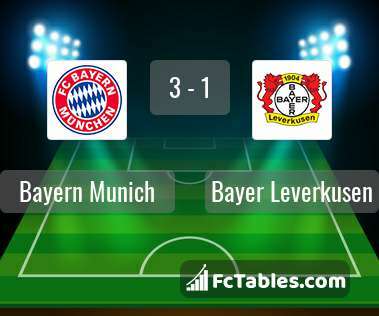 Bayern Munich won 27 matches , Bayer Leverkusen won 7 direct matches, was a 9 draws. In 24 matches the sum of the goals both teams was greater than 2.5 (Over 2.5), and 36 matches teams scored more than 1.5 goals (Over 1.5). 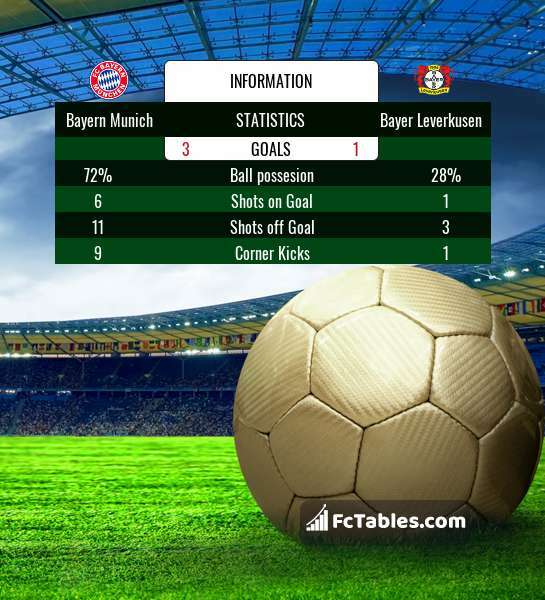 In 24 matches the both teams scored a least one goal (Both teams to score).